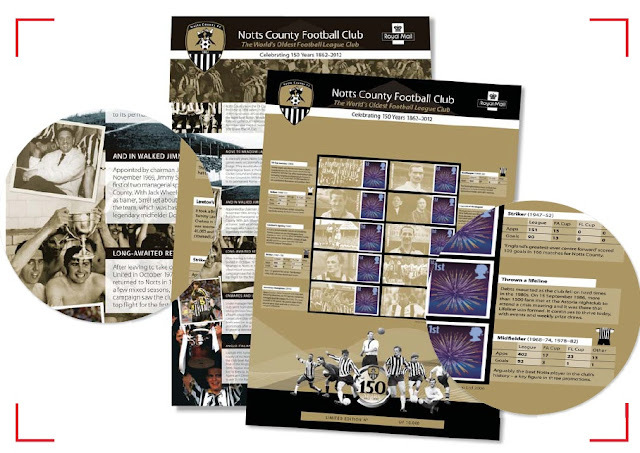 Commemorative Stamp Sheets for Notts County FC and the Goon Show this autumn. 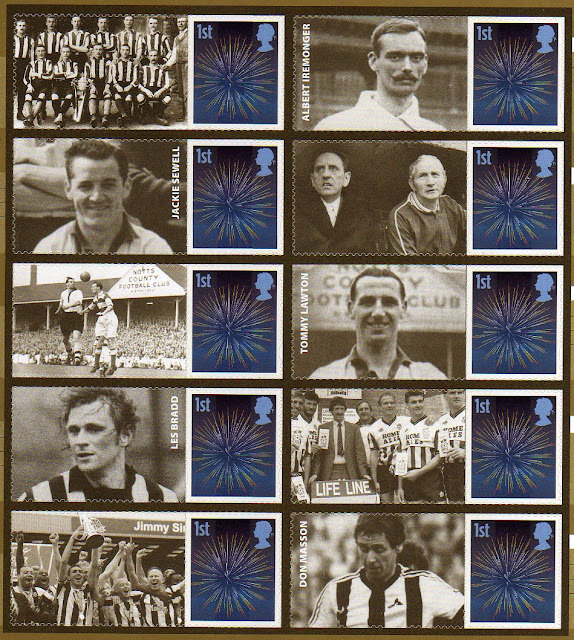 Royal Mail has announced the issue of two premium-priced Commemorative Sheets during the second half of 2012. 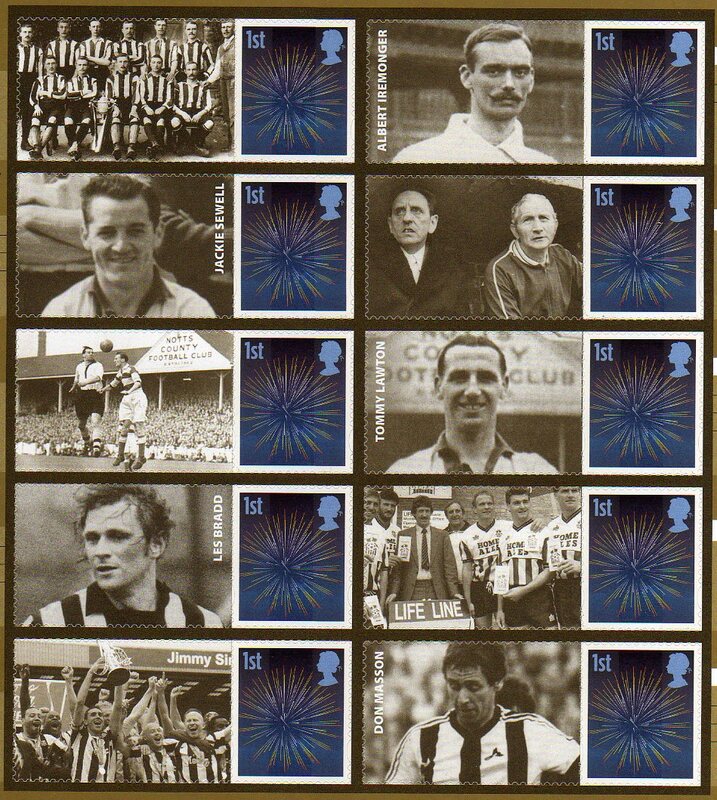 Each sheet will sell for £14.95, and can be ordered from Royal Mail's website closer to the date of issue. Some Post Office Branches may stock them. 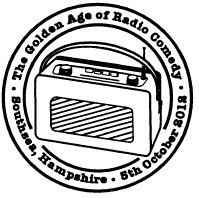 The product code for ordering from Royal Mail is AV018. 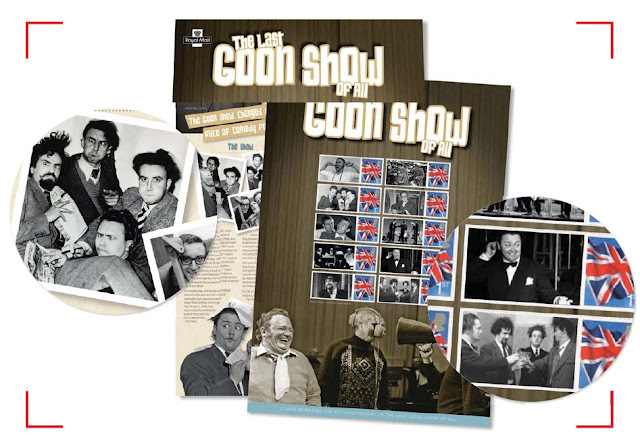 The first, to be issued on 5 October, marks the 40th anniversary of the last Goon Show – the groundbreaking radio series widely recognised as playing a unique and significant role in the history of British comedy. 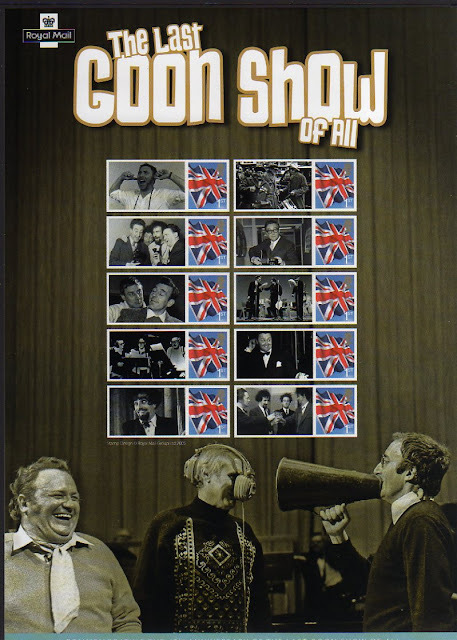 "... explores the conception and development of the show and features photos, quotes and stories about the Goons, the people behind the comedy phenomenon, the main characters in the show and some of its most illustrious fans, such as His Royal Highness Prince Charles and Sir Noël Coward." It also explains the infl uence its creator and main script writer, Spike Milligan, had on subsequent comic writers and performers like Peter Cook, the creators of Monty Python’s Flying Circus and Eddie Izzard. 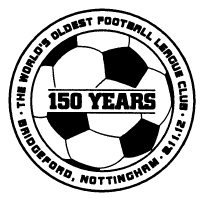 The second sheet, to be issued on 8 November, celebrates the 150th anniversary of the world’s oldest football league club, Notts County. 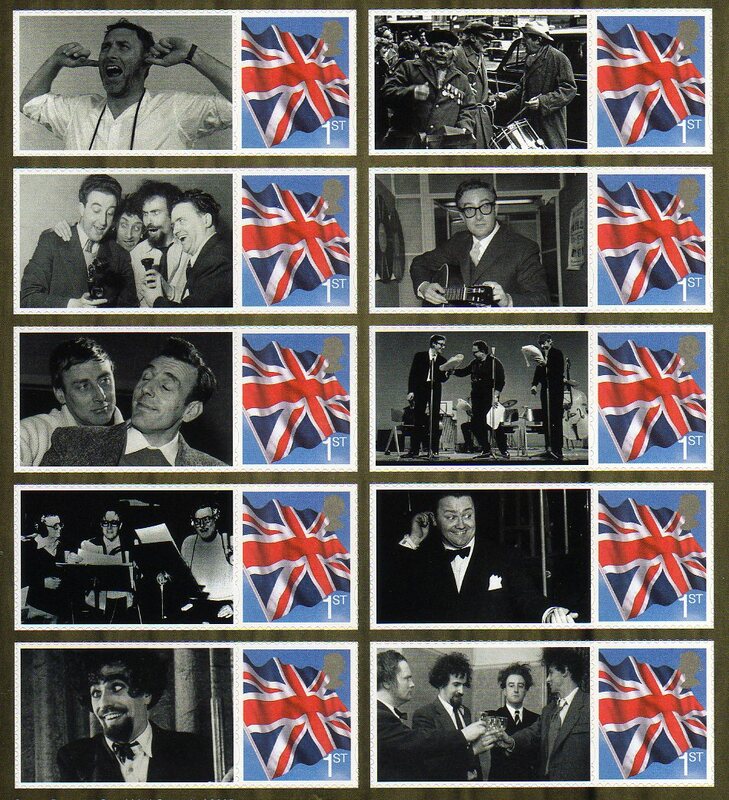 The Royal Mail product code for this is AV019. "Including key facts and figures about Notts County and featuring notable past players and managers, the Commemorative Sheet contains a wealth of images and fascinating stories about the club since its formation in 1862. 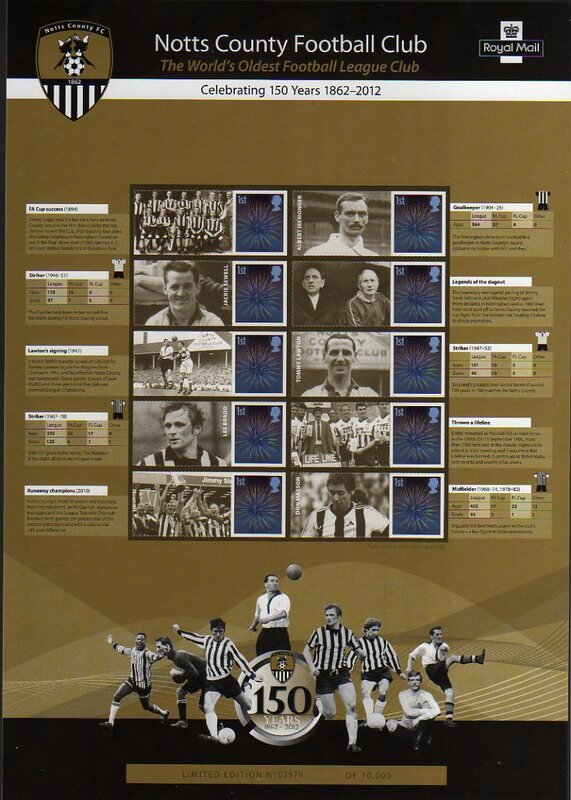 It also explains the historic relationship Notts County has with the current Serie A champions, Juventus. As an individually numbered limited edition of 10,000, this is a must have for football aficionados and those interested in the history of the game." £14.95 for £6.00 worth of stamps which are readily available from numerous other sources. Does anyone actually collect these things? I don't know that people actually collect them, as much they are bought by people who are interested in the subject. You shouldn't assume that all philatelic products are bought by stamp collectors. 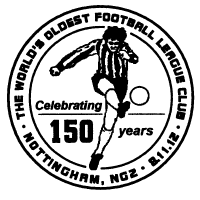 We don't deal in them as a matter of course, but we sold several Territorial Army ones, and a few 1908 Olympics. The best seller, to alumni, was for the Cambridge University anniversary. They aren't buying the stamps, they are buying the memories and souvenir. I can't see any more Prestige Stamp Booklets coming. Is there any reason that you know of for RM seeming to slow down with these? Aside from the fact that they can't cope with their existing stamp programme, no. 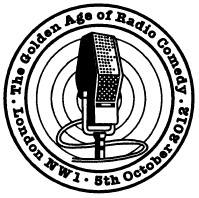 But there will be some more in 2013.